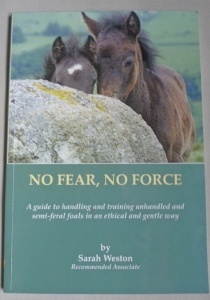 A guide to handling and training unhandled and semi-feral foals in an ethical and gentle way. The techniques described in the book have a relevance to every horse owner, no matter what the age of the horse. Written by Sarah Weston, Recommended Associate of the Intelligent Horsemanship Association. Published in 2009. The book contains a wonderful quote from her husband "My wife, Sarah, is wonderful with me but she is even better with the ponies! She has a natural ability to find a way into their souls. I sometimes think she is a horse, she even shies at leaves." The techniques were taught to our staff by Sarah and the book contains some photographs of our foals taken at The Exmoor Pony Centre. We still use these methods today.